The complement system, consisting of soluble and cell membrane–bound components of the innate immune system, has defined roles in the pathophysiology of renal allograft rejection. Notably, the unavoidable ischemia-reperfusion injury inherent to transplantation is mediated through the terminal complement activation products C5a and C5b-9. Furthermore, biologically active fragments C3a and C5a, produced during complement activation, can modulate both antigen presentation and T cell priming, ultimately leading to allograft rejection. Earlier work identified renal tubule cell synthesis of C3, rather than hepatic synthesis of C3, as the primary source of C3 driving these effects. Recent efforts have focused on identifying the local triggers of complement activation. Collectin-11, a soluble C-type lectin expressed in renal tissue, has been implicated as an important trigger of complement activation in renal tissue. In particular, collectin-11 has been shown to engage L-fucose at sites of ischemic stress, activating the lectin complement pathway and directing the innate immune response to the distressed renal tubule. The interface between collectin-11 and L-fucose, in both the recipient and the allograft, is an attractive target for therapies intended to curtail renal inflammation in the acute phase. The innate immune system, composed of humoral, cellular, and physical barrier defenses, plays an essential role in the immediate and nonspecific response to invading pathogens. A vital subset of innate immunity is the complement system. Complement defends against invading organisms, clears immune complexes and cell debris, and provides an interface between innate and adaptive immunity.1 Specifically, complement consists of interactive soluble proteins, membrane-bound receptors, and regulatory proteins. For many years, the focus of immune modulation in organ transplantation has been on the adaptive immune system. However, it has been within the last 15 years that several new aspects of complement biology with respect to solid organ transplantation have emerged. We now know that complement helps direct the alloimmune response to solid organ transplants not only through contributing to damage associated with ischemia-reperfusion injury but also through a significant role in the augmentation of T cell– and B cell–mediated immunity.2,3 Indeed, not only has the role of complement as an effector of Antibody-Mediated Rejection (ABMR) been updated,4 but it is also required to prime effective antibody production against donor tissue.5 In addition, recent evidence points to complement activation as a significant factor in the progression of chronic native kidney disease, which is likely to have generic application relevant to the transplanted organ.6 How these observations will be translated to the clinical realm remains to be identified, as any intervention will need to weigh its effect on organ injury and rejection with dampening the antimicrobial functions of the complement system, such as opsonisation, cell lysis, and recruitment of neutrophils and other inflammatory cells.7 It is our belief that therapeutic strategies can be designed to specifically target the key initiators of complement activation at the relevant location, such as complement-binding anti-HLA antibodies in the vascular compartment or the initiator(s) of local complement activation in the extravascular compartment of the allograft itself. In this article, we will discuss the roles of various complement recognition pathways in ischemia-reperfusion injury and allograft rejection with particular focus on the role of carbohydrate both as a danger signal and a potential target underpinning complement activation after ischemic insult and likely downstream adaptive immune recognition. Our review will cover (1) The Complement System, (2) Complement in the Development of Adaptive Immunity, (3) Role of Complement in ABMR, (4) The Lectin Pathway (LP) as a Mediator of Organ Injury, (5) Role of mannan-binding lectin (MBL) in Tissue Injury, (6) Role of Ficolins in Tissue Injury, and (7) Collectin-11 as a Mediator of Renal Epithelial Inflammation, followed by our concluding remarks. Complement is activated on the surface of pathogens as well as damaged or infected cells via one of three main pathways: the classical, alternative, or lectin pathway.8 These distinct pathways converge at the formation of C3, which is then cleaved to form C5 convertase, with the subsequent production of the terminal pathway complement components, comprising C5a and the membrane attack complex (C5b-9) (Figure 1). Classical pathway activation typically occurs through antibody-antigen complex binding of C1q to the Fc portion of IgM or IgG,1,9,10 which forms part of the C1 complex with classical pathway–specific serine proteases C1r and C1s. The alternative pathway, activated by hydrolysis of plasma C3 and enhanced in some circumstances by an absence of complement inhibitors on cell membranes, also functions as an amplification pathway after the generation of C3b by the classical or lectin pathways.11,12 In contrast, LP initiation takes place through pattern-recognition molecules such as MBL, ficolins, surfactant proteins, and the recently identified C-type lectin, Collectin-11 (CL-11; CL-K1), all of which bind to carbohydrate motifs. The complement cascade. 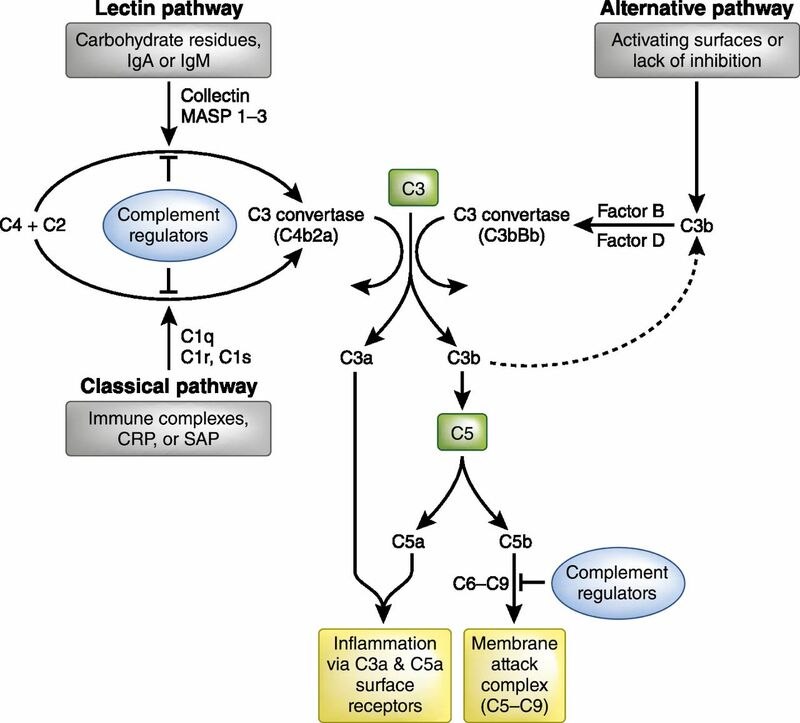 The complement system is activated by one of three major pathways: classical, lectin, or alternative. The classical pathway is triggered by C1 binding to immune surveillance molecules such as IgG, IgM, C-reactive protein (CRP), or serum amyloid protein (SAP) which are attached to the target sequence. The LP is triggered by the binding of collectins, such as MBL and collectin-11, or ficolins to carbohydrate residues on a pathogenic surface or IgA and IgM molecules. The alternative pathway is initiated by direct binding of C3b to activating surfaces. All three pathways converge at the production of the central complement component C3. That is, all pathways form enzyme complexes (classical or alternative convertases) that cleave either C3 (into C3a and C3b) or C5 (into C5a and C5b). C5b triggers the terminal pathway by creating a pore in the target cell membrane via the formation of the membrane attack complex (C5b-C9). Soluble complement effectors C3a and C5a are detected by specific cell receptors thereby promoting inflammation. Complement inhibition occurs via a variety of molecules ultimately inhibiting C3 and C5 convertase or blocking the formation of the membrane attack complex (C5b-C9). Under normal physiologic conditions, complement activation is controlled by surface-bound and soluble proteins that mediate the degradation of complement convertases, ultimately preventing the formation of complement effectors C3a, C3b, C5a, and C5b-9. Fluid phase complement-regulating plasma proteins include C1 esterase inhibitor (C1 INH), C4b binding protein, factor H, and factor I. Cell-membrane regulatory proteins include decay-accelerating factor (DAF; CD55), membrane cofactor protein (MCP; CD46), and CR1 (CD35). These proteins modulate the complement response and protect host cells and tissues from damage related to complement activation.13 During inflammation and cell stress this equilibrium shifts away from regulation and can lead to uncontrolled complement-mediated injury and rejection.14 Indeed, after renal ischemia-reperfusion injury, which is an unavoidable consequence of transplantation, postischemic renal dysfunction is dependent on the local conversion of tubule-derived C3 to its activated form,15 which growing evidence suggests is mediated through triggering of the LP,16,17 discussed in more detail below. Complement activation pathways and allograft immunity. Complement-mediated injury may occur in the intravascular or extravascular compartments. Ischemia-reperfusion injury increases extravascular cell surface expression of a fucosylated ligand that is thought to be recognized by Collectin-11 which associates with MASP-2, in conjunction with MASP-1 and MASP-3, to activate complement via the LP. After the cleavage of C3 and C5, the membrane attack complex (C5b-9) forms, resulting in inflammatory injury and cell death. Complement plays several roles in sensitization against donor alloantigen. Antigen presenting cells (APCs) express complement components C3 and C5 in addition to complement receptors C3aR (C3a Receptor) and C5aR1 (C5a Receptor 1). Generated by complement activation in the extracellular space, C3a and C5a enhance APC priming of T cells by increasing the presentation of alloantigens and the expression of costimulatory molecules. Additionally, C3a and C5a promote CD4+ T cell differentiation and cell longevity. Furthermore, APCs promote proliferation and differentiation of CD4+ and CD8+ T cells. CD8+ T cells mediate cellular rejection in both the intravascular and extravascular compartments which is identified pathologically as endothelitis and tubulitis, respectively. CD4+ T cells stimulate B cell proliferation and ultimately antibody production. In addition, the B cell response to alloantigen may be directly enhanced by complement,5 because it has been reported for nontransplant antigens25,30 that opsonisation by C3b and its metabolite C3d can enhance antigen presentation via the complement receptor CR2, which is present both on follicular dendritic cells and B cells in secondary lymphoid tissue.26 Binding of the B cell receptor with the opsonized antigen lowers the threshold for B cell activation and allows for class switching of the donor-specific antibody from IgM to IgG. ABMR occurs when donor-specific antibodies recognize antigens on renal allograft endothelial cells engaging with the C1q, C1r, and C1s complex to initiate complement activation via the classical pathway. Again, C3 and C5 convertases are created and the membrane attack complex subsequently formed. Clinical evidence of complement activation is generally ascribed to the identification of C4d on evaluation of a renal biopsy specimen. All rejection pathways whether complement or cellular based present clinically with evidence of graft dysfunction characterized by increasing serum creatinine and decreasing urine output. Renal ischemia-reperfusion insult leads to local, extravascular compartment complement activation through a C4-independent pathway with subsequent formation of C5a and C5b-9, suggesting a contribution to continued inflammation via the alternative pathway.15 Although a subsequent study in complement factor B–deficient mice confirmed a role for the alternative pathway, the complement recognition pathway that triggered injury was not conclusively identified at this stage.40 More recently, the LP was implicated as the primary mode of renal complement activation and subsequent tissue injury after ischemic insult.17,41 Complement activation via the LP begins when one of a number of pattern recognition receptors (PRRs) binds to a pathogen-associated molecular pattern (PAMP) that is displayed on the surface of an invading microorganism, or when a PRR binds to a damage-associated molecular pattern (DAMP) displayed on endogenous ligands during inflammation or cell stress (Figure 3).42 There are a variety of LP PRRs in the complement system, which include: collectins, which are soluble collagen-like lectins, such as MBL and collectin-11 (CL-11)43; surfactant proteins (SP-A and SP-D); and ficolins (ficolin-1, ficolin-2, and ficolin-3).44 A common and key feature of these PRRs is their interaction with MBL-associated serine proteases (MASPs), of which there are three, named MASP-1, MASP-2, and MASP-3.45,46 The LP was initially thought to be activated through the action of MASP-1 and MASP-2,44 whereas MASP-3 has been implicated in activation of the alternative pathway.47 The observation of complement activation when the collectin-MASP complex binds to ligands of invading pathogens or endogenous material demonstrated that LP activation was critically dependent on the action of MASP-2.48 In rodent models, MASP-2 has been shown to be an essential mediator of reperfusion injury in both native and transplanted organs.16,17,49 Traditionally, LP activation proceeds through MASP-2–mediated cleavage of C4 and C2 leading to formation of C3 convertase (C4b2a). Recent work, however, has shown the activity of a C4-independent bypass lectin activation pathway.16 In this study, MASP-2 was found to mediate injury in the absence of C4 in both cardiac and intestinal ischemia-reperfusion injury. Further studies in a renal isograft model comparing wild-type and MASP-2–deficient mice showed that renal function was preserved with MASP-2 deficiency and the effect of MASP-2 was independent of C4, implicating the C4 bypass route of activation as an important mediator of tissue injury.17 These observation help explain why C4-deficient mice are afforded no protection in both native renal ischemia15 and cell-mediated allograft rejection models.50 Studies on human sera from MASP-2–deficient patients support the existence of a C4-bypass pathway in man.16 Thus, there exists a novel mechanism of LP activation and a number of candidate pattern recognition molecules that could trigger this mechanism. We will now consider the evidence for the most relevant of these molecules in the context of allograft injury, especially of the kidney. Renal tubule epithelial cells appear to be the main source of CL-11 in normal renal tissue, with increased expression after renal ischemia-reperfusion injury.69 Additionally, CL-11 was found to colocalize with carbohydrate ligand L-fucose on inflamed proximal tubule cells. A critical observation was that complement component C3d, a marker for complement activation, was present on the basolateral surface of the renal tubule cells in the hypoxia-sensitive zone only where CL-11 and L-fucose engage.69 Further support for the role of CL-11 in complement-mediated renal injury was the observation that CL-11–deficient mice were resistant to postischemic renal failure and associated complement-mediated damage, indicating the role of local complement activation in the extravascular compartment. The mechanism for this is believed to be through abnormal expression of a fucosylated ligand at the hypoxia-stressed cell surface, thereby allowing CL-11 to bind and subsequently initiate MASP-2–mediated complement activation.69 Understanding the nature of the fucosylated ligand(s) is critical to the design and application of relevant therapies to block the interaction of these molecules in the setting of renal inflammation. 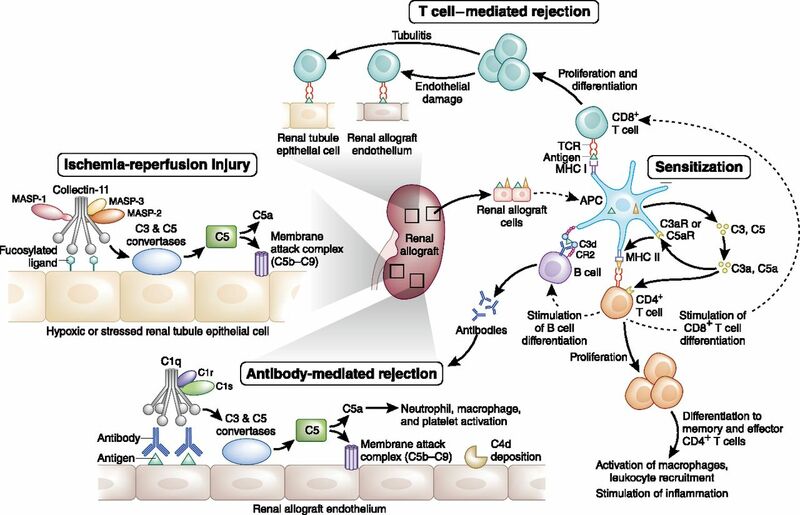 As laboratory investigation into complement-binding DSAs as well as the triggering of CL-11–mediated complement activation continues, work is taking place in the clinical realm to further understand and modulate the role of complement-mediated injury in renal transplantation. Clinical trials will aid in determining if complement inhibition is a viable therapeutic option. There is no doubt that therapies such as eculizumab (anti-C5) have shown great promise for certain complement-mediated pathologies such as paroxysmal nocturnal hemoglobinuria and atypical hemolytic uremic syndrome. Indeed, clinical trials continue on the potential use of C1 INH and eculizumab in treating and preventing ABMR of solid organ transplants.13,36 Recent bench work has identified various complement components at play in both the vascular and extravascular compartments. It is likely that these components cause allograft injury via separate, although not mutually exclusive complement recognition pathways, which may have a subsequent effect on how future therapies are delivered in the clinic. Examples include specific DSA subtypes as well as the LP as potential earlier targets for intervention rather than the downstream complement components, C3 or C5, to reduce the risk of ABMR or the pathogenic response to ischemia-reperfusion, respectively. Local production of CL-11 at the site of tissue injury may be the distinguishing feature that sets it apart in functional terms from other pattern recognition molecules of the lectin complement pathway. Further understanding of complement-binding DSAs and the initiation of the LP and associated tissue ligands will allow for a clearer picture of the molecular and cellular mechanisms at play and hopefully lead to more precise therapeutic interventions. Some of the work described was supported by the Medical Research Council grants MR/J006742/1 and MR/L020254/1 and G1001141, and by the National Institute for Health Research (NIHR) Biomedical Research Centre based at Guy’s and St. Thomas’s NHS Foundation Trust and King’s College London. The views expressed are those of the authors and not necessarily those of the NHS, the NIHR, or the Department of Health.